Something that I spend time pondering about frequently is the sorry state of my dehydrated skin. I drink water a lot – a lot a lot – and spend a lot of time looking after my skin and constantly try to rehydrate it. My cheeks are also dry, so my skin can be a bit of a challenge. 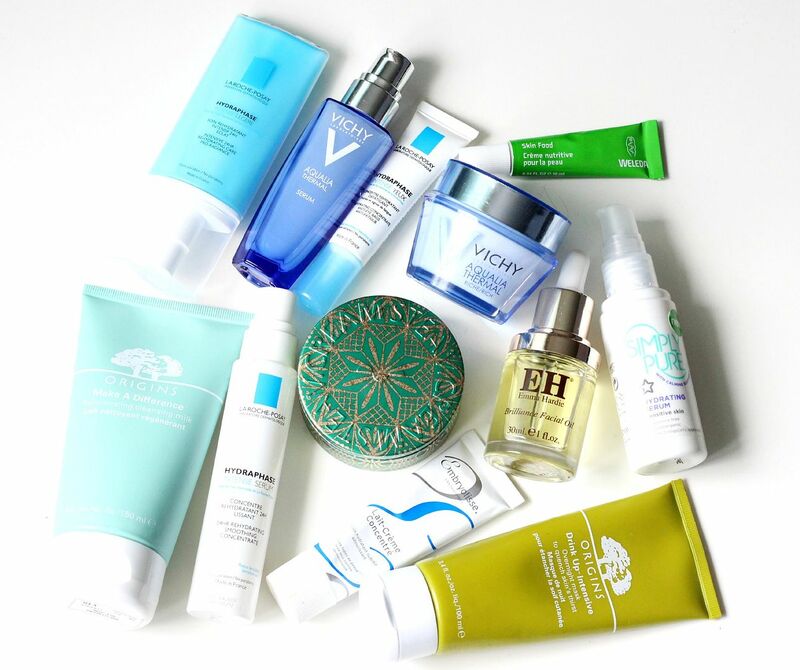 I’ve whittled down a lot of products thought, and thought I’d just chat about all my favourite picks for dehydrated skin. For cleansing, I use balms and milk cleansers – nothing foaming here, no sir. My old faithful, that I always go back to when I want something really comforting is the Emma Hardie cleansing balm. You just can’t beat it. I always try to go for something moisturising and the thing I want to avoid is my skin feel tight or dry straight after cleansing. Hydrating serums – serums really are the way forward for tacking a specific skin concern. It’s kind of like the primer that allows your other skincare to work far more effectively and they also seem much more potent than any moisturiser could ever be. The Superdrug hydrating serum is really cheap and particularly moisturising. The La Roche Posay Hydraphase has a gel texture and is one I like to use in the morning to make my skin feel fresh. The Vichy Aqualia serum is also sensational for adding some plumpness and hydration to the skin. Oils – I always use an oil before moisturiser, and always try to give myself a little facial massage at night. Depending on how dry, you could change how many drops of oil you use – I normally use 3/4 on my drier skin and spend about 3 minutes massaging it in. Oil cleansers are also worth trying. Eyes – If you have really dry eyes – like me – the Weleda skin food manages to keep my eyes moisturised all day, and steamcream is also so so good to use as an eye cream. Moisturisers and masks – I love the Origins make a difference range in its entirety, and the moisturiser is pretty special. I find that my skin seems to drink moisturisers up so quickly – classic dehydrated skin. I can use something really rich, but my skin will still be feeling dry by the time I take off my makeup. For masks I like to try and use something moisturising twice a week. My skin gets so dry you guys. Masks are definitely one of those things that I love the idea of, and love it when I have it on but it’s just the thought and the effort of doing it. Just me? Am I too lazy.